Between the twelfth and thirteenth centuries several well-known artists from Northern Italy were active in Tuscany and left remarkable examples of their work in cities like Lucca, Pistoia and Prato. In the early twelfth century, Guidetto da Como was working on the cathedral in Lucca where he sculpted the small colonnades on the fa�ade. Awhile later in San Giovanni in Corte in Pistoia Lanfranco dei Guidi sculpted the baptismal font: a great basin composed on the inside of two circular sections faced with marble, one of which bears the inscription and date of the work. The outside of the font is also decorated, with square panels in white and red marble carved with ornamental motifs typical of the Romanesque period. 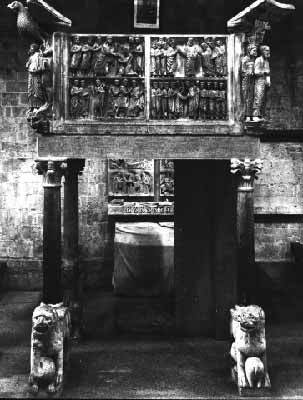 Another artist Guido Bigarelli carved one of his masterpieces for Pistoia: the pulpit in the church of San Bartolome.